The cooperation of INNO3D and Alphacool has brought out a liquid cooled mining graphics card with fantastic perpformance. Based on the NVIDIA GP104 this combination can be overclocked as much as possible - sill operating at low temperatures. This results in an increased mining income as same as a longer lifespan and the guarantee to run at 100% even at high room temperatures. 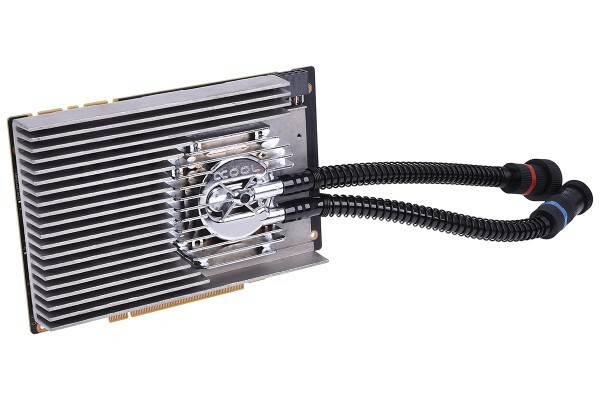 Eisbaer-Ready: The pre-assembled Alphacool GPU water block can be connected to a liquid cooling system by the quick coupling connectors. A liquid cooling system is required to run the graphics card and not part of the shipment. The graphics card is a mining card and therefor has no vidoe or monito outputs. This graphics card can be easily combinated with the mining board number 1015391. For mining hash rate opimization reasons only 4GB memory will be used during operation.